EDINBURG — In nearly three years that she’d been his personal banker, Rocio Perez had never seen Martin Knell Sr. without his wife. But shortly after Thelma “Penny” Knell was admitted into hospice care due to ailing health, the then 95-year-old man showed up to Perez’s Chase Bank branch with another woman, a younger woman — Monica Melissa Patterson. The next time Perez saw Knell, which was about three weeks later, $400,000 was missing from his bank account. 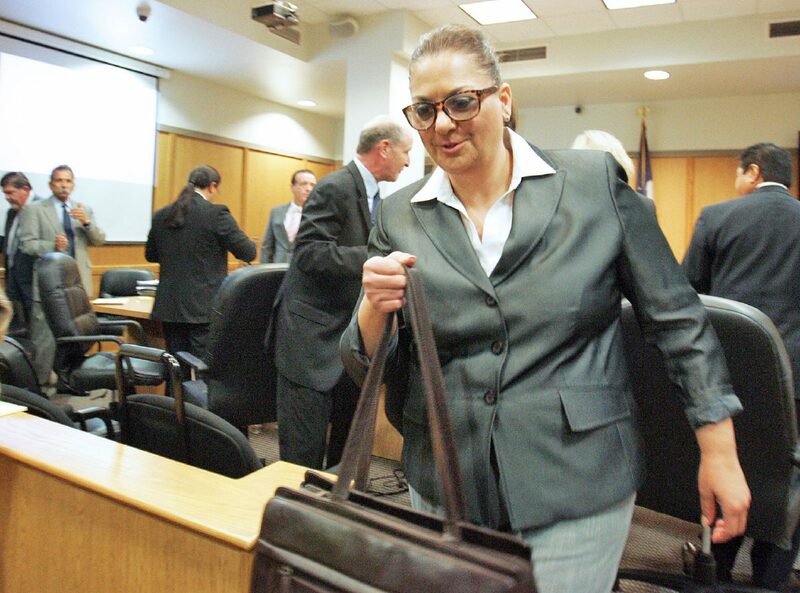 Perez was one of two witnesses to testify Friday as the prosecution continued with questions regarding finances and expenses at McAllen’s Comfort House, the hospice care facility where Patterson served as executive administrator at the time of Knell’s death. The other witness, Melissa Chavez, a caregiver at Comfort House who was moved to administrative liaison/finance in February 2014, was questioned about her office duties for the care facility for four hours. Chavez, who served in the aforementioned role a few months before quitting, said expenses were accounted for through receipts that she was given by Patterson. Chavez’s testimony was exhaustive, as the defense poured over bank account paperwork and questioned Chavez about which accounts she was aware of. But Chavez, now more than three years removed from the position, peppered them with “I don’t knows” and “I don’t recalls” to the chagrin of Patterson’s high-profiled team. Chavez and Perez’s testimony, and that of two bank employees and a CPA earlier in the week, underscores the prosecution’s strategy to establish a motive for Patterson in Knell’s alleged murder. During Perez’s testimony, she revealed that she and her family — in the course of about three years — had become close to Knell and his wife, often visiting them for lunch and even inviting them to her own family’s Christmas. She testified that when Knell walked in with Patterson, 50, on Oct. 8, 2014, and after providing him with information about his account, she felt uneasy about Patterson’s presence during Knell’s visit to the bank. The testimony from the women came a day after the defense established through a crime scene investigator’s testimony, that they had no physical evidence linking Patterson to any of the multiple locations where authorities had executed search warrants. Despite the slow-paced testimony, Patterson, who on the first day of the trial was seen staring in the direction of jurors, appeared in good spirits, laughing and joking with her all-star defense attorneys and chatting-up friends and family in the audience during brief breaks. 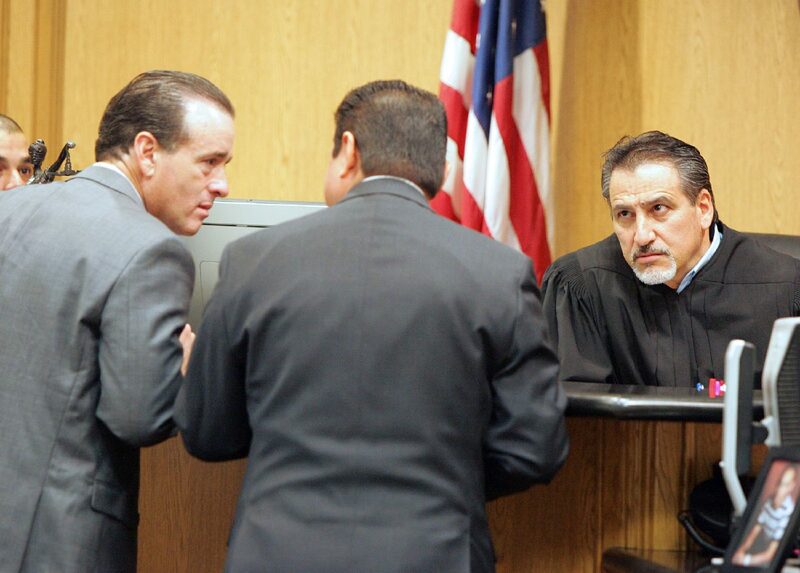 Perez was dismissed from the stand shortly before the court recessed for the weekend. Day six of testimony begins Monday with the prosecution yet to call several key witnesses. They include Knell’s caretaker, who reported seeing Patterson and another man, Angel Mario Garza, arrive at Knell’s home the day he died. This story was updated to reflect Angel Mario Garza’s name as it appears in court documents, and the circumstances surrounding the caretaker witnessing Monica Melissa Patterson and Garza entering Martin Knell Sr.’s home on the day that he died.